Learn more about the Chesapeake Oyster Alliance's work to accelerate the Chesapeake Bay's recovery by restoring its oyster population. Oysters filter and clean the waters of the Chesapeake Bay and provide critical habitat for other aquatic life. But the oyster population is just a tiny fraction of what it once was historically. 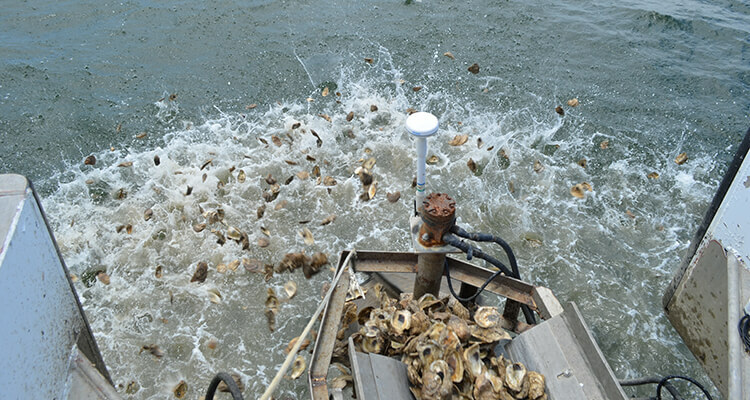 Restoring the Chesapeake's native oyster population is key to bringing back the Bay's health. What are oyster sanctuaries? And why are they good for the Chesapeake Bay? Find out in this edition of Back to Baysics. Today as science has taught us so much more about these threats to the Chesapeake Bay's health, we are thinking about an old question in a new way. Were oysters once abundant because the Bay had clear, clean water or did the Bay have clear, clean water once because oysters were abundant? Not the unsolvable chicken and the egg riddle but a real world research challenge with profound consequences for the success of Bay restoration. This segment of "The Incredible Oyster Reef" shows how oysters build reefs in the Chesapeake Bay. This segment of "The Incredible Oyster Reef" explores the benefits of oyster reefs. This segment of "The Incredible Oyster Reef" explores the important habitat that oyster reefs provide for other creatures in the Chesapeake Bay ecosystem. This segment of "The Incredible Oyster Reef" shows the remarkable contribution oysters can play in improving water quality in the Chesapeake Bay. This segment of "The Incredible Oyster Reef" warns of the threats facing the Chesapeake Bay's iconic native oyster. CBF President Will Baker talks with Jackie Shannon and Heather North—experts from CBF's Virginia oyster restoration center—about rebuilding the Bay's living water treatment centers.